I love to do arts and crafts projects around the house, and especially with Sarah. However, the less messy approach is what I prefer versus the more messier, which Sarah seems to like. Therefore, I was intrigued when Twitter Moms and Glue Dots® Adhesives approached me to get involved in a "Summer Bonding Project" with a glue-type product that is mess-free. Let's just say my interest was piqued. One we received our complimentary Glue Dots products Sarah and I got right to work on seeing what we could create together. The first project we worked on together was created in time for Father's Day and Daniel's birthday. Sarah and I sat calmly on the living room floor surrounded by the supplies we were going to work with including the new Glue Dots. While I have read that some kids are well able to dispense the dots from the handheld device Sarah at nearly age two and a half kept getting her fingers stuck to the dots or pulling out the paper from the device. So, we took a slightly different approach. I started to make shapes with the dots and then let Sarah choose, on her own, various colored pom poms to place on top of the dots. What I appreciated most about this new glue tool was that it was not messy and we could go at a comfortable pace not worrying about glue getting everywhere or drying out. 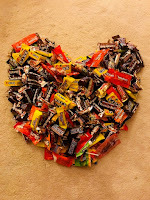 When we completed a heart, for example, Sarah wanted to do more, and more, and more. We got to tracing out her hands and feet and other objects with the Glue Dots. She and I were having fun...a lot of fun. 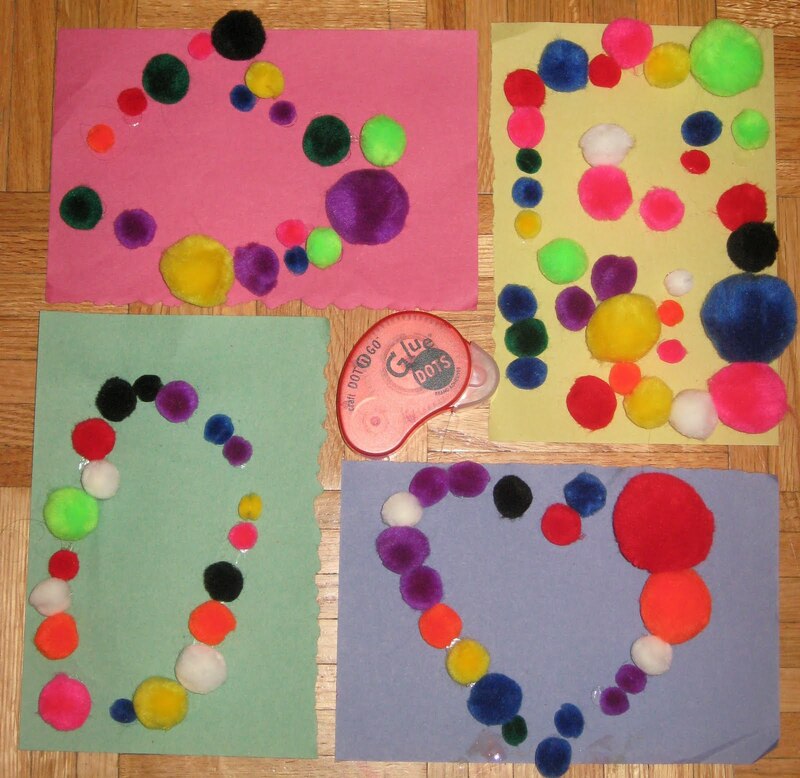 The Glue Dots designed more for arts and crafts projects seem better to adhere paper to paper versus pom poms or glitter to paper. At first the pom poms stuck great, and easily. After a few days they started to fall off one by one. 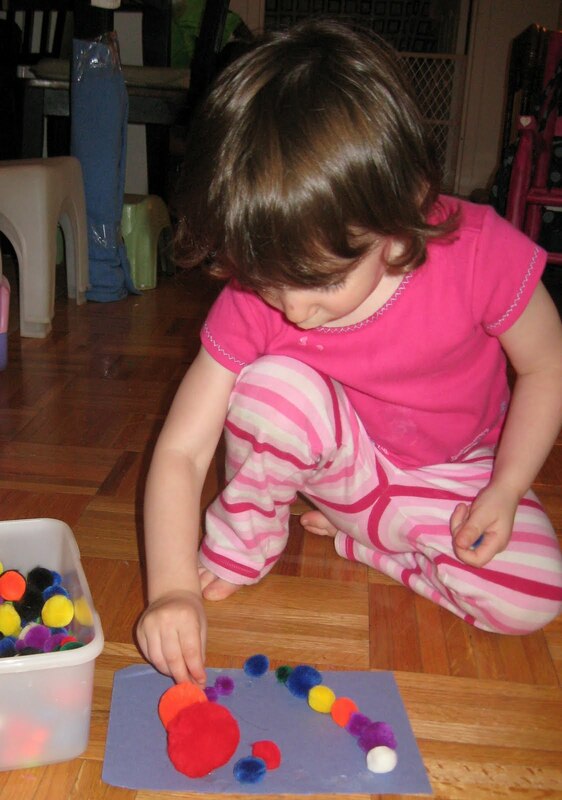 I will say this, since my child really gets into her work and sometimes gets very messy, it was nice to see Sarah in a more calm state enjoying sticking things to the glue dot circles on the paper. It's was the most serene temperament I had experienced with her when doing a creative project. 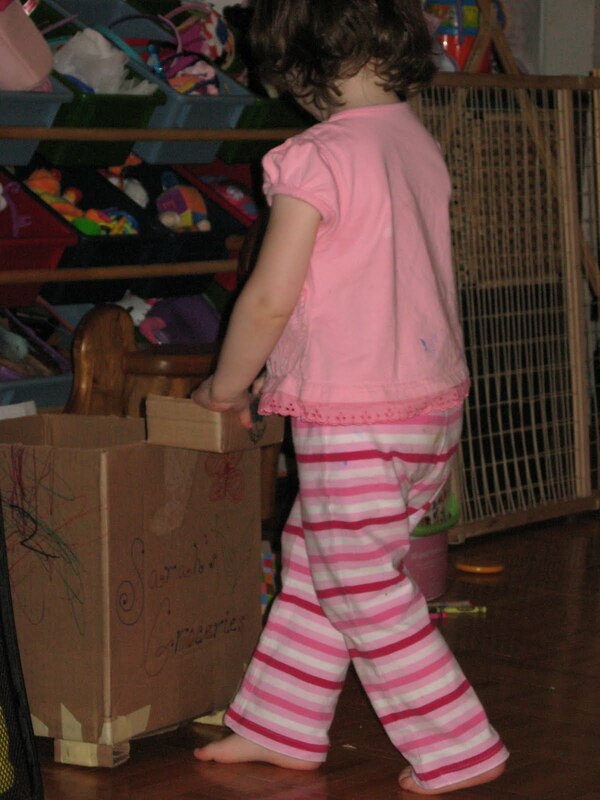 And, I was not chasing her around the room trying to prevent her from getting her sticky fingers on the furniture, walls, etc. This was a fun and relaxing and creative project we could do together. I could see Daddy doing something like this with Sarah too. No fuss no muss. The cool thing, too, about Glue Dots is that there are many type s of adhesives under this brand for a number of uses including paper/photos, metal, wood, plastic, textiles, plastic, foam, and more. I am excited to explore new and interesting projects with Sarah, and for other household and creative projects in the future. Here are some of the creations Sarah and I made together. We traced Sarah's foot and hand, did a heart and one project with no rhyme or reason, just pure fun. We also made a grocery cart out of a box and used the Glue Dots to add the picture she colored to the front. For additional ideas to use Glue Dots check their Facebook Fan Page with cool projects from others. 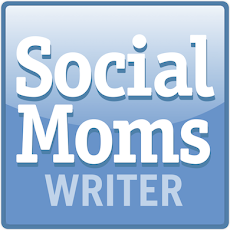 Please know, I wrote this blog post while participating in the TwitterMoms and Glue Dots blogging contest to be eligible to receive a $30 gift card. While it would be nice to win the gift card I was extremely appreciative for the opportunity to try out this product that I might not otherwise have considered, and happier for it. For more information on how you can participate and learn more about this cool new glue tool click here. 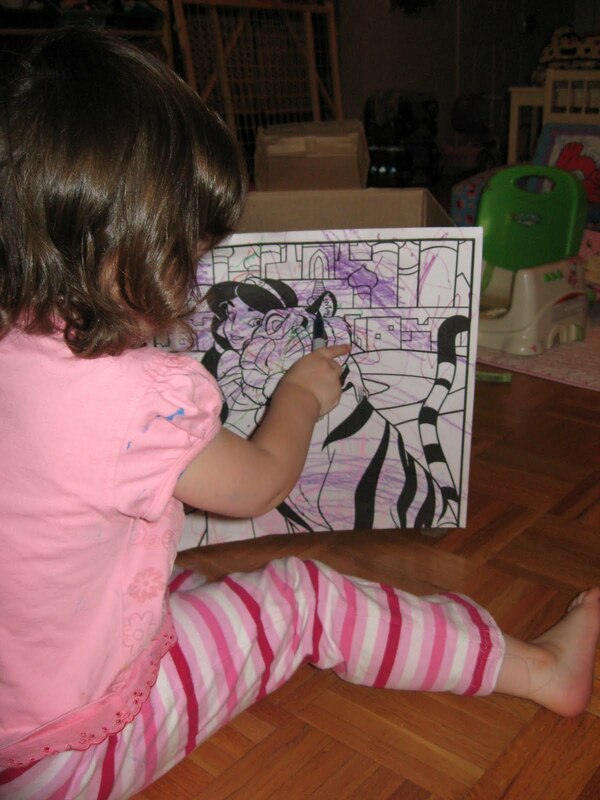 Art projects are a great opportunity to bond with your kids too. Happy creating!